Unless you go totally wireless, you need wires to connect the computers, thus creating the network. You use a cable known as Cat 5, or Category 5, networking cable. One end of the cable plugs into your computer (into the NIC), and the other plugs into a central location, or hub, as illustrated in this figure. It’s possible — and rather convenient — to run networking cable through your home’s heating ducts. If you choose to do it this way, be sure that you buy special high-temperature cable, rugged enough to stand being inside a heating duct. You use plenum cable, and it ain’t cheap. 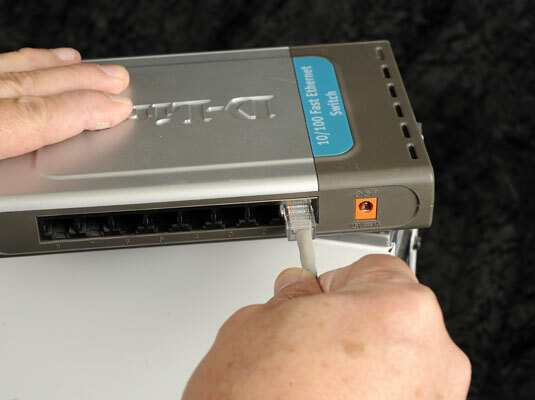 Another way to network computers is by using the IEEE 1394, or FireWire, port. It’s possible to connect two PCs, such as a desktop and laptop, by using the IEEE port and then configuring Windows to use the port for networking. A FireWire connection isn’t a solution for connecting many PCs or for sharing a printer or a broadband modem.